In the past on Geeky Hobbies we have looked at quite a few variant/spiritual successor games. That is partially due to the fact that a lot of designers like to take popular public domain games and tweak them in order to preserve the original while also improving on some of the issues with the original game. One game that I am a little surprised hasn’t had a lot of variant games is the card game of Blackjack AKA 21. While Blackjack is a really simple game that is mostly played in gambling situations, I am a little curious why more games haven’t tried to implement the Blackjack mechanic. 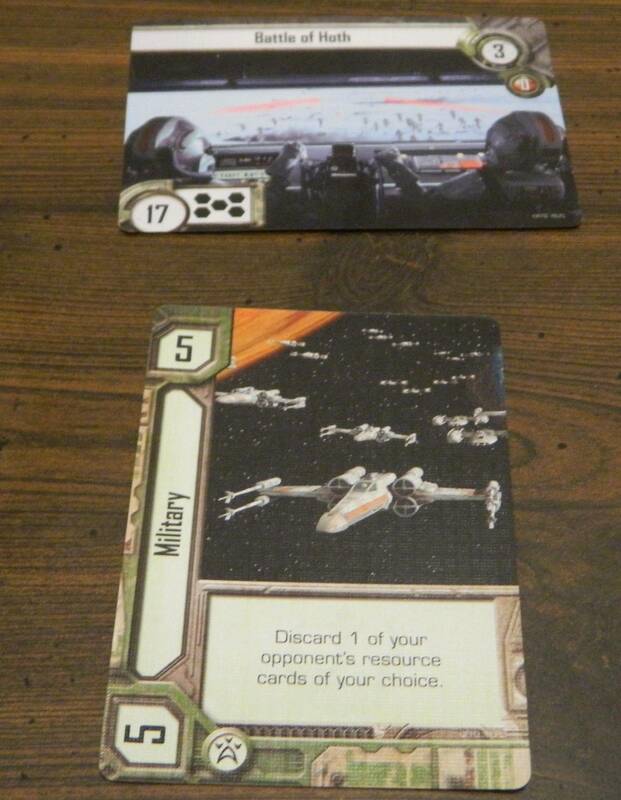 Well today I am looking at a game that has tried to improve on the game of Blackjack by adding more strategy along with a Star Wars theme, Star Wars: Empire vs. Rebellion. Star Wars: Empire vs. Rebellion is a little on the simplistic side but it is still an enjoyable and accessible game that Star Wars fans should enjoy. Separate the cards into the different types of cards based on the back of the cards. Shuffle all of the event cards and place them face down in the middle of the table. The two players decide which will play as the rebels and which will play as the imperials. Each player takes the cards for their chosen faction. 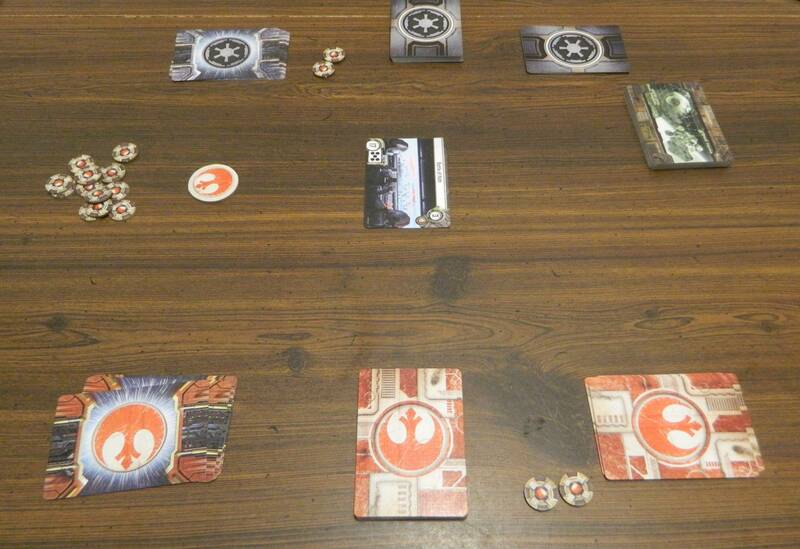 Each player places their faction strategy cards face down on the table. Each player chooses four of their character cards and adds them to their resource deck. The other character cards are placed face down on the table creating their reserve pile. Each player shuffles their resource deck and places it face down on the table. Two influence tokens are given to each player. The players choose which side of the balance token will be placed faceup. Both players complete each phase before moving onto the next phase. If after a round is finished neither player has won the game, another round is played. The planning phase is comprised of two steps. Capacity (bottom left): The number of dots indicate how many cards that a player can place face up in front of themselves. Objective Value (bottom left): The number indicates the total resource value that the players are trying to reach. Victory Points (top right white): Indicates how many victory points the card is worth to the player that wins it. Influence Value (top right red): Indicates how many influence tokens that the winner of the card will receive. Effect: Details the effect of the card which will impact the struggle or dominance phase. The capacity for this event is five cards. The objective value is 17 which means players need to get a total as close to 17 as possible. This event will be worth three victory points to the player who wins the event. This event has an influence value of 0 which means the player won’t get any influence tokens for winning the card. Finally this event card does not have a special effect. After flipping over the event card, each player chooses one of their strategy cards to use for the round. These cards are placed face down and are revealed later in the round. Once a strategy card is used it cannot be used again until a player has used all of their strategy cards. 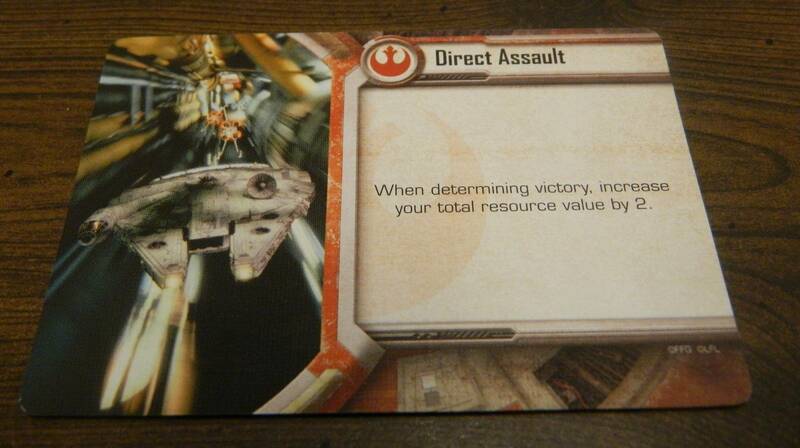 When a player chooses to use this strategy card they will add two to their total resource value. If a player chooses to draw a card they draw the top card from their resource deck. They immediately place the drawn card face up in front of themselves in the ready position (where it can be read by the player who played it). When drawing/playing cards a player is unable to draw/play another card if they are already at their capacity limit (indicated on the event card) for the round. This player has drawn a military card and plays it in front of themselves. The second action a player can take is to use one of their card’s powers. A player can only use the abilities on one of the cards played out in front of themselves if that card is in the ready position. A player cannot use the power of an exhausted card. When a player uses a power they follow the directions on the card and then turn the card sideways to the exhausted position. The left resource card has the power of exhausting one of the resource cards that have been played. If Yoda’s special power is used the player will gain an influence token. A player can also choose to spend one of their influence tokens in order to ready one of the cards that are currently exhausted. 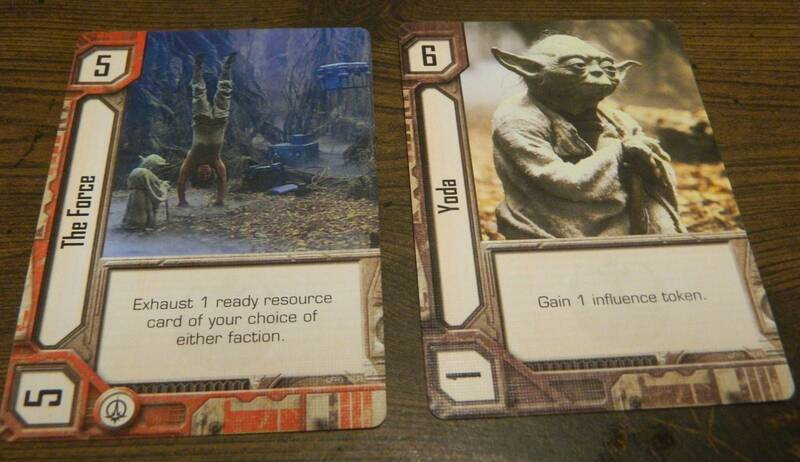 When the influence token is used the card is turned to an upright position. By using one of their influence tokens this player will be able to use Leia Organa’s special ability again. The final action that a player can take is to pass their turn. When passing their turn a player does nothing. A player is still allowed to take an action on a future turn if they passed a previous turn. If a player passes their turn and then the other player passes their turn, the struggle phase ends. The dominance phase begins with both players revealing their strategy cards. Each player will take the action on their strategy card as long as the total of their resources don’t exceed the event’s objective value. After the strategy cards have been resolved players will determine who wins the card. Whichever player’s total resource value is closest to the objective value without going over will win the card (one strategy card does alter this). If there is a tie, the faction showing on the balance token gets to take the card. If both player’s total resource value is above the objective value, neither player will win the card. This player has played five cards worth a total of 17 points for this event which has an objective value of 17. The player who wins the card gets to place it in front of them and it counts as the number of victory points printed on the card. The player who won the card also gets to take influence tokens from the supply equal to the influence value printed on the card. The players will then cleanup for the next round if neither player has enough victory points to win the game. Each player takes all of the cards they used in the round and shuffles them into their resource deck for the next round. The balance token is turned to the side of the player who has less victory points. If both players have the same number of victory points, it is turned to the side that lost the last round. Finally each player discards the strategy card they used so it can’t be used in the next round. If a player has used all of their strategy cards they take all of them back for the next round. The game ends when one player has earned seven or more victory points. That player has won the game. This player has acquired eight victory points and has won the game. I began this review talking about Blackjack since when you break down Star Wars: Empire vs. Rebellion it plays a lot like an advanced version of Blackjack. Basically the premise of the game is pretty much the same. Instead of the target always being 21, players are trying to accumulate cards that add up to a total as close to the objective for the round without going over. Players are only able to flip over cards blindly so they don’t really have much impact over what cards they get to use. The objective of the game is to win the most hands to acquire the victory points required to win the game. If Star Wars: Empire vs. Rebellion left it at that point the game would have been basically a ripoff of Blackjack. The good news is that the game takes the basic premise from Blackjack and adds some strategy to the game. While you don’t have much control over what cards you end up drawing, the game gives you some special abilities that let you manipulate the cards in front of yourself and the other player. Every card has a special ability that you can use to affect the game. The ability on every card can only be used once unless a player uses an influence token to reactivate the card. Players keep playing cards and using abilities until both players pass. Both players compare the values of their cards with the player closest to the objective winning the card. Being based off of Blackjack it shouldn’t surprise anyone that Star Wars: Empire vs. Rebellion is a simple game. Basically if you know how to play Blackjack and can handle some special abilities you pretty much already know how to play the game. Outside of teaching a couple simple mechanics the game is easy to pick up and play.The powers might seem complicated at first but they are quite straightforward to the point that I can’t see anyone really struggling with the game even if they don’t play a lot of card/board games. As far as strategy is concerned I would say that Star Wars: Empire vs. Rebellion is more on the light side of the spectrum. Initially players have no control over what cards they end up playing since you have to play the top card from the draw pile. Basically all of the strategy comes from using the card powers. Good use of your powers could gain you an edge over the other player as you can manipulate the cards in front of yourself or the other player in order to strengthen your position or weaken their position. The best strategic option for a given situation is usually pretty obvious though. The good news is that there isn’t much analysis paralysis in the game but it does leave you wanting a little more control in the game. Other than the use of your card’s powers, the only other opportunity for strategy comes from the strategy cards. Each player gets five strategy cards and each player has to choose which one to use each round. Since all of the cards have to be used before one can be repeated, players need to figure out which one would work best for their strategy in each round. In the early rounds players have to just guess what card the other player is going to play but as cards are used you can narrow down what cards your opponent could play in future rounds. This can create some interesting decisions as you try to play a card that works well against the card your opponent is going to play. In general I would say that the strategy cards don’t play a huge role in the game. One card lets you add a character to your resource deck (which you will probably use pretty early), another card lets you get extra influence if you lose a round, and another card lets you add two to your resource total. One card lets you choose your opponent’s strategy card for the next round but it isn’t as useful as you would expect since that player can see what card you choose for them. It does let you see what strategy card they are using for the next round though which could work well if you choose a strategy card that works well against it. The most interesting strategy card is the deception card since it actually rewards the player who has the least amount of resource points. If a player uses this strategy card they could trick the other player into getting as many points as possible while limiting their own points. When you add in the fact that if both players play the deception card the effect is nullified, it is kind of interesting trying to figure out what strategy card your opponent played. While Star Wars: Empire vs. Rebellion has some issues which I will get to shortly, I think it is a fun little card game. No one is going to confuse it for a highly strategic game but it is good for what it is trying to be. The game does a good job of taking the premise from a game like Blackjack and adding enough strategy that it actually feels like you have some control over the game. The game will work well as a filler game as it is pretty quick and you don’t have to put too much thought into the game. 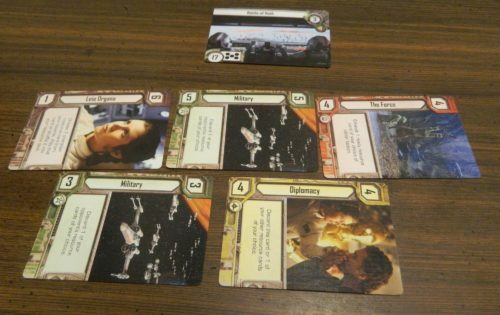 Basically if you want a pretty simple card game that you can quickly pick up and play I think you will enjoy Star Wars: Empire vs. Rebellion. I think the biggest issue I had with Star Wars: Empire vs. Rebellion comes from the mechanics that it borrows from Blackjack. While the game has some strategy, the game does rely more on luck. Basically if you don’t draw the right cards no strategy is going to win you the game. Outside of cheating you basically have to hope that you draw the right cards since you have to use the cards that you end up drawing. The only way to change any of your cards is to get a card that lets you discard them. If you don’t draw any of these cards you are basically going to be stuck with what you draw. This would probably drastically change how the game is played but I would be interested in seeing how the game would play if players were able to have a hand of two or three cards which they could choose from when playing a card. This wouldn’t give players too many options on what card they wanted to play but would still give players a little more control over their fate. Giving players a hand of just two would drastically reduce the amount of luck in the game as the players could at least choose which of the two cards they would prefer instead of having to hope they draw the right card. Outside the reliance on luck I think the biggest problem that I had with Star Wars: Empire vs. Rebellion is the fact that the two factions are basically the same. The strategy cards and resource cards are exactly the same for both factions. The only difference between the two factions come from the characters cards. The special abilities of the characters for both factions do differ. While the character cards differ, each character has a character from the other faction that has a similar ability. While on the topic of character cards I would like to mention that I don’t think all of the characters were created equally. While all of the characters have situations where they can be quite beneficial, some characters just seem to have a lot more uses than other characters. For example Princess Leia is quite powerful for the rebels since she can be used to add more characters into a player’s deck. 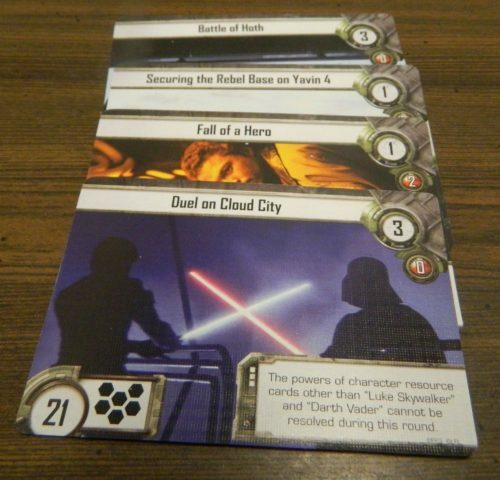 Since the character cards are the best cards in the deck, this can give the rebel player a big advantage in the game. Meanwhile on the empire side Darth Vader is quite powerful since he can remove a character card from the other player’s deck which will put the empire at an advantage. While these two cards have lasting impacts on the game, other cards only let players discard cards or gain an influence token which just don’t seem as powerful in my opinion. They have their own uses but they seem to have more specialized purposes. So while I didn’t really like the fact that the two factions are basically the same I can see why the decision was made. With both factions being basically the same players can’t really complain about one faction being better than the other. I like that the two decks are even since one player won’t have a built in advantage. This evens out the game so the winner is likely going to come down to who plays their cards the best and who gets lucky and draws the best cards at the right times. Even though the game is probably more fair with both factions having basically the same cards, the two factions lose any potential differentiating characteristics. When you are playing a Star Wars game where the rebels are facing off against the empire you expect the two factions to play differently. Both factions should feel unique where each have their own strengths and weaknesses. That really isn’t the case in Star Wars: Empire vs Rebellion as it makes no difference if you choose the rebels or empire. While this doesn’t ruin the game it really hurts the game’s theme. Another issue that I had with Star Wars: Empire vs. Rebellion is the fact that the game’s theme feels kind of pasted on. I will say that I thought the game’s artwork looks really nice and fans of Star Wars will appreciate it. 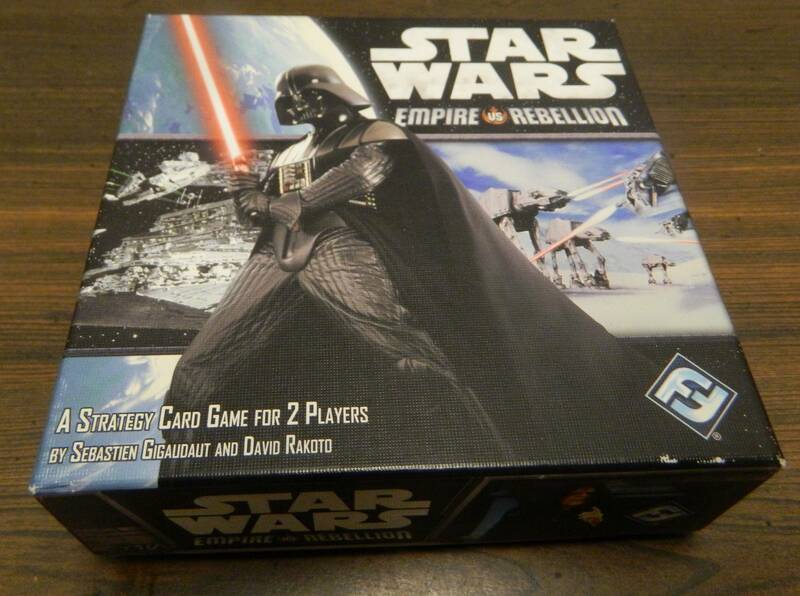 The problem is that the game feels like a normal card game that used the Star Wars theme to try and sell more copies. The theme of Star Wars does not come into play at all as far as the gameplay is concerned. The fact that the gameplay doesn’t really take anything from the theme is not that surprising because it turns out that the game was based on the card game Cold War CIA vs KGB with some small tweaks to the gameplay. While the theme is not terrible I think the game could have done much more with it so it didn’t feel so pasted on. Should You Buy Star Wars: Empire vs. Rebellion? When I first started playing Star Wars: Empire vs. Rebellion I will admit that it wasn’t what I was expecting. Basically the game plays like an advanced version of Blackjack. Just like in Blackjack the objective is to acquire cards that get you as close as possible to the objective without going over. What is unique about Star Wars: Empire vs. Rebellion is that all of the cards have a special ability that can be used to either manipulate your own face up cards or the face up cards of the other player. This gives players some strategic options to manipulate the cards in front of them. Basically Star Wars: Empire vs. Rebellion is a simple card game that is pretty fun. The game is not perfect though as the game relies pretty heavily on luck. Whoever draws better will likely win the game. In addition I really didn’t like that the two factions for the most part play exactly the same and the game kind of wastes the Star Wars theme. If you don’t really care for the Blackjack mechanic or Star Wars, I don’t think you are going to like Star Wars: Empire vs. Rebellion. 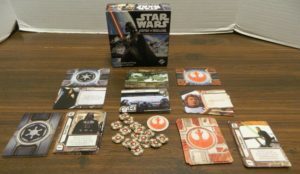 If the idea of a more strategic Blackjack intrigues you or you are looking for a simpler Star Wars card game, I think you will enjoy Star Wars: Empire vs. Rebellion. Does a surprisingly good job improving Blackjack. A fun and accessible card game. The two factions are basically the same and the game wastes the theme's potential.